If you’re in the business of snow and ice removal, you’ve more than likely heard about the salt shortage plaguing the Midwest and Northeast. 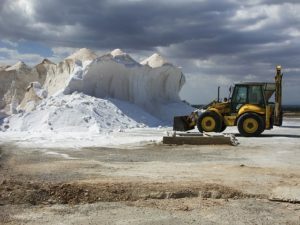 An unexpected late season ice storm last spring, a labor strike at the world’s largest salt mine, and issues surrounding a large mining operation in Ohio have resulted in a deficit in a salt deficit as plow companies begin stocking their supplies for winter. Since municipalities typically get first dibs on road salt, private plow companies are sent scouring the globe for reliable suppliers. As is the curse of supply and demand, snow removal businesses that are able to find a salt source will likely be shelling out more than double the usual price. Additionally, since North American reserves are virtually empty, or at least will be once government bids go through, salt will need to be imported from overseas, tacking on the high cost of freight and logistics to an already expensive commodity. However, snowfighters are no strangers to salt shortages and, as a result, many have developed inferior alternatives to rock salt as well as conservation strategies to use less salt. They’re also learning to keep an eye on the market and winter weather predictions and secure their salt supply long before the first snow of the season. A few business leaders in the industry have shared their advice for making it through the salt shortage. Troy Clogg, owner of Troy Clogg Landscape and Snow Associates in Michigan, explains, “The sooner we all find and secure a salt deal to meet our needs the better off we will be going into winter, negotiating contracts and sharing this process with the end user: our clients. I strongly urge you to educate yourself and educate your clients on the process of procuring salt. Knowledge is always powerful and helpful.” Learn more about how Troy mitigates risk with snowfall insurance. Another way snow contractors can mitigate the risk associated with the salt shortage is by investing in snowfall insurance. Spectrum offers snowfall insurance for excess snowfall–which covers additional supplies and labor costs if snowfall exceeds what is covered in a contract–as well as insurance that can make up for the loss in jobs if there’s a lack in snowfall during the season. Learn more about snowfall insurance here.